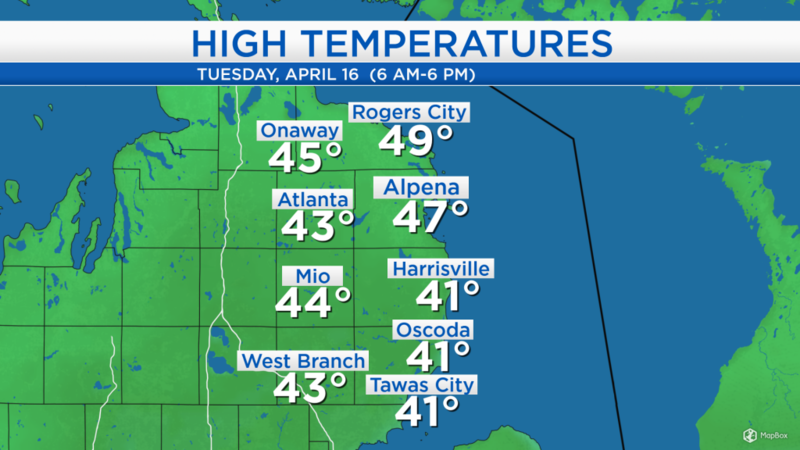 High temperatures today reached 47 degrees in Alpena, although most spots were a few degrees cooler. The coolest temperatures in Northeast Michigan were along the shoreline from Harrisville to Tawas City because of a light breeze from the southeast, off of Lake Huron, cooling temperatures near the lake. 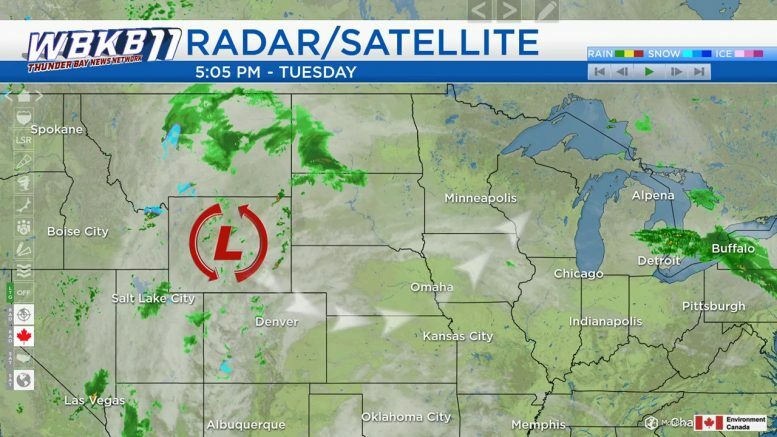 A low pressure system over the Rockies will travel through the Plains, then turn to Northern Michigan. This will bring widespread rain to our area beginning late tomorrow, about 0.5-1 inch is expected tomorrow afternoon through nighttime, followed by additional rain Thursday. Skies will likely remain dry through midday tomorrow. Morning temperatures will start in the middle 30s, then afternoon highs will reach the upper 40s. Rain will first move into western parts of our area tomorrow afternoon, and reach the Lake Huron shoreline in the late-afternoon or early-evening. Downpours are expected tomorrow evening with temperatures in the lower 40s. 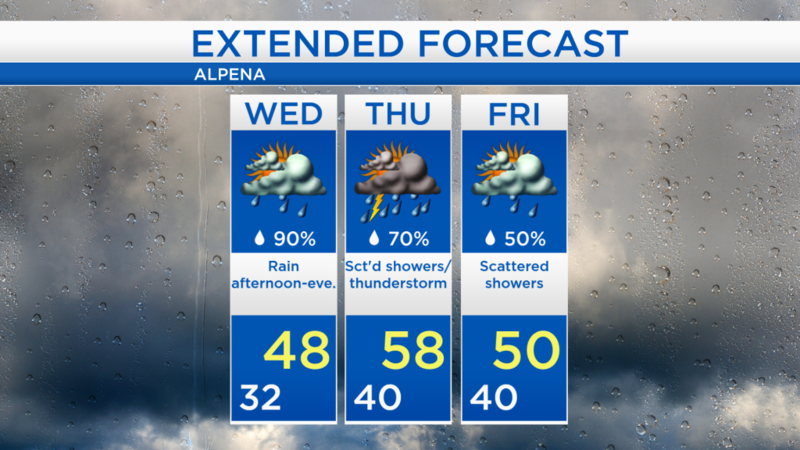 A wet pattern will begin late tomorrow, rain will become steady tomorrow evening. A few thunderstorms are possible predawn to midday Thursday, then showers remain possible through much of the day. There is a slightly lower chance of scattered showers on Friday. Finally, drier air should enter our area this weekend. 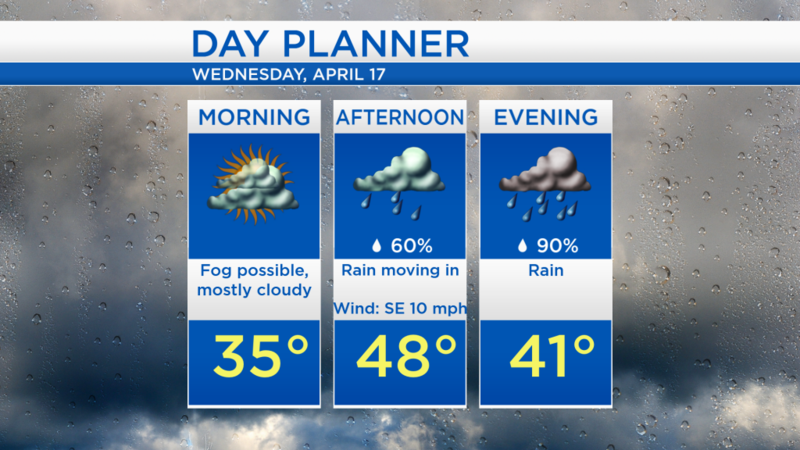 For tomorrow, skies will start mostly cloudy morning and midday, then rain becomes likely late-day and evening. Winds out of the southwest will likely push temperatures to the upper 50s Thursday afternoon. Rain with a few thunderstorms are possible during the first half of Thursday, then the chance of thunderstorms decreases although showers remain possible. High temperatures close to 50 degrees are expected Friday with mostly cloudy skies and a chance of showers. For the rest of Northeast Michigan’s weather forecast, watch the latest weather video by clicking the weather tab at the top of the page.